I love concepts cars and modular type, so Honda’s Urban EV is right up my alley. My new pixel typeface family. SbB Codebreaker selected as an honorable mention for the Fontstruct Reverse Competition and a Top Pick. My odd entry for the Fontstruct Reverse Competition. My new experimental unicase typeface, SbB Runabout Superwide, was named a Fontstruct Top Pick. I'm really excited about how it's turned out. Or to be more accurate, is turning out... It's still very much a work in progress. My intent is to use Runabout as the foundation of a whole series of fonts — with a range of widths, weights and designs. You can download SBB Runabout Superwide over at Fontstruct. I started working on some sketches for a new typeface design and moved over to Fontstruct to prototype. I really like the way the prototype turned out, even if it looks virtually nothing like my sketches. Unicase, but mostly lowercase. Most unicase designs are primarily uppercase, but Runabout is mostly inspired by the lowercase. Short ascenders and descenders. I tried to keep the design vertically compact, with very short ascenders and descenders. Flexible. I’m releasing two weights: Regular and Superwide. My plan is the have a range of weights and widths. Aligning the accents. I’m playing around with the idea that accents don’t need to be centered over the letter. Work in progress. I’m going to continue to develop Runabout. I don’t know if I’ll release more on Fontstruct or if I move development over to Glyphs. * You can see and download all my published Fontstruct designs on the Sketchbook B Fontstruction page. I’ve long been a fan of the Eric Gill’s designs. * I worked at a company for a few years were Gill Sans was one of the typefaces in the corporate identity. And I later designed an annual report entirely in Joanna. His book, An Essay on Typography, is an interesting look at typography during the industrial revolution and is a great read if you are interested in historical models for typesetting. Monotype has released new, expanded versions of Gill’s most well known designs. More weights and versions make these designs better fits for modern identity systems. Gill Sans Nova adds a number of weights and widths without losing the charm of Gill Sans. And it keeps the wackiness of the heavier weights – which I think is a good thing despite the fact that I still hate the lower case, ultra bold i. New alternate characters are a great addition and display versions add inline, shadow and deco versions that look sharp and playful. But Joanna Nova gets the most attention and is the most impressive part of this release. ** Previously limited to three weights — light, roman and bold, Joanna now boasts 10 weights. The italic versions are beautiful, too. And add to that a new sans serif — Joanna Sans — to serve as a companion. With all this depth and complexity, I think it’s a matter of time before we start to see Joanna used in new identity systems everywhere. Each of the families is $99 for limited time, or you can spend $199 for the entire Eric Gill Collection. Monotype has a site for the release that lets you look at everything in detail. 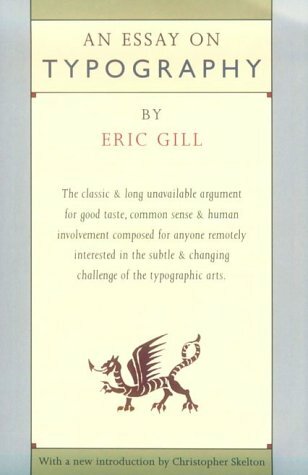 * I’ve long been a fan of Eric Gill’s designs, but not a fan of Eric Gill himself. We wasn’t a good man at all. ** I might be biased. Joanna has always been one of my favorite fonts and most people don’t know about it. Joanna has always been my favorite "best typeface you've never heard of" recommendation to young designers.